If a picture is worth 1,000 words, how many words is an infographic worth? After you’ve thought that one through, then just how many words is a 3D infographic worth? You’ve seen infographics on countless website pages — these are the beautiful, graphic visual representations of information, designed to convey knowledge quickly and to engage users. Are we on the way to seeing infographics in 3D, that we can hold in our physical or virtual hands? I would venture to say that the 3D-printed object you see in the image above an infographic. Created by British artist Luke Jerram, it’s a three dimensional representation of the 9.0 Tōhoku earthquake that hit Japan eight months ago. Jerram named it the “Tōhoku Japanese Earthquake Sculpture,” and it’s 11 inches long by seven inches wide. 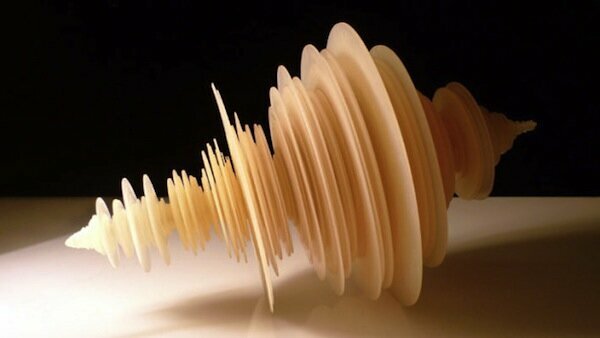 The artist took a nine minute span of the seismometer data, created a 3D image of it in a CAD program, and then sent it off to a 3D printer. We do not yet know the 3D printer or 3D printing service he used, but are curious if anyone knows. The piece will be shown in the “Terra” Exhibit at the Jerwood Space in London this month. All of Luke’s work is unusual and impressive; you should visit his website and browse around. Infographics in 3D may not surpass 2D infographics any time soon, but when 3D or holographic displays come to market, be prepared for an eyeful. And a handful.